Queensland Premier Annastacia Palaszczuk has announced she will strip Katter’s Australian Party of five extra staff positions it was granted last term, after it refused to denounce federal senator Fraser Anning’s contentious maiden speech last month. 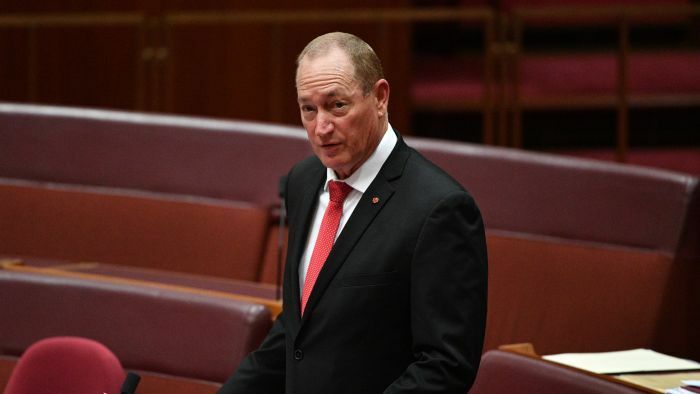 Senator Anning used his maiden speech in Federal Parliament to call for a complete overhaul of the immigration system, insisting most migrants should be from a European Christian background and all Muslims should be banned. In that speech, he also used the phrase “final solution”, the same phrase used by the Nazis under Adolf Hitler meaning annihilating Jewish people from Europe. Ms Palaszczuk had called upon the KAP to denounce Senator Anning or face losing the five extra discretionary staff granted to the state party last term during the hung parliament. The ABC understands this includes three parliamentary staffs and two electorate staff members, and the move could be halted if the KAP changed its position. “Because his party will not denounce Senator Fraser Anning, I denounce his party,” she told the Labor State Conference on Sunday. Ms Palaszczuk said “racist extremism will not be tolerated”. “To believe as we do in equality and basic human rights means we do not merely support their existence … we stand up to and call out those who would rip them way,” she said. Ms Palaszczuk said her own grandparents fled the work camps and appalling conditions and misery of World War II to come to Queensland. “We have the right to free speech in our parliaments, but that free speech is not free of consequence,” she said. State leader Rob Katter was unaware of the decision when contacted by the ABC this morning. When Ms Palaszczuk threatened to reduce his party’s parliamentary staff funding, Mr Katter said previously the Premier would effectively be punishing his constituents by cutting back his staff over a difference of views. “I think this is a very serious breach of democracy in Queensland and freedom of speech,” he said. Mr Katter said the KAP backs a vote on immigration. “I’m happy to explain [to] the Premier our position, and I’m sure she’d be comfortable with the fact that we want a mature debate on immigration,” he said at the time. Mr Katter said it would be “silly” for the Premier to cut their staff because his party provides good value for money, claiming the KAP introduced more private members bills in State Parliament than the LNP. “Annastacia Palaszczuk made this agreement in the last term of Parliament because they needed their vote. They continued it this term just as a back-up plan. Now they realise they don’t need the Katters,” he said. Senator Anning was unmoved by the widespread criticism he received after the speech and his party leader Bob Katter has called the speech “magnificent” and “solid gold”. Mr Katter said he discussed the speech with Senator Anning before he delivered it. Minister for Multicultural Affairs Alan Tudge said Senator Anning’s comments did not reflect the views of the Government. Senator Anning replaced One Nation’s Malcolm Roberts in Parliament after Mr Roberts was found to be a dual citizen. Senator Anning’s speech was reminiscent of Pauline Hanson’s first speech as an MP in the mid-1990s. The One Nation founder called for multiculturalism to be abolished, saying Australia was in “danger of being swamped by Asians”.